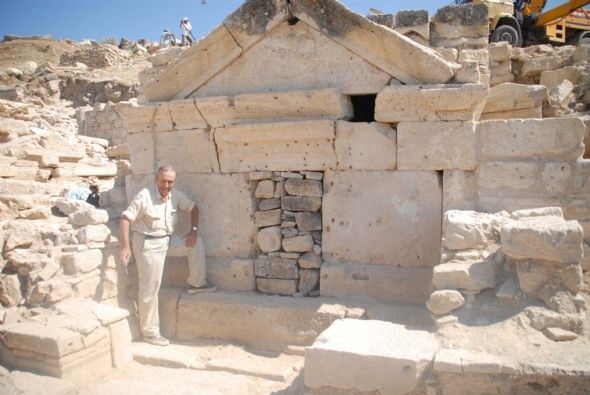 Italian professor Francesco D’Andria has announced the apparent discovery of the tomb of St. Philip, one of Jesus Christ’s apostles, at the ancient city of Hierapolis in the Aegean province of Denizli. The discovery of the grave of the biblical saint, who was killed by the Romans 2,000 years ago according to the tradition, will attract immense attention around the world. St. Philip, one of the 12 apostles, came to Hierapolis 2,000 years ago to spread the Christianity before being killed by the Romans, the professor said. D’Andria has been leading archeological excavations at the ancient city for 32 years. “Until recently, we thought the grave of St. Philip was on Martyrs’ Hill, but we discovered no traces of him in the geophysical research conducted in that area. A month ago, we discovered the remnants of an unknown church, 40 meters away from the St. Philip Church on Martyrs’ Hill. And in that church we discovered the grave of St. Philip,” said D’Andria. D’Andria and his team have not opened the grave but are planning to do so soon. “St. Philip is considered a martyr. In fact, the church built in his name on the Martyrs’ Hill is, for this reason, also called Martyrion, despite the fact there were no traces of the grave of St. Philip. As we were cleaning out the new church we discovered a month ago, we finally found the grave. With close examination, we determined that the grave had been moved from its previous location in the St. Philip Church to this new church in the fifth century, during the Byzantine era. We are extremely happy and proud to have discovered the grave of a saint whose name appears in the bible – this surely is an important discovery for religious tourism, archaeology and Christendom,” the professor said. Professor Francesco D’Andria poses in front of the entrance of the church.